Cast: Sylvester Stallone, Antonio Tarver, Burt Young, Geraldine Hughes. You must bear in mind that I never liked the Rocky movies much - so when I tell you that Rocky Balboa is a waste of everybody's time, you might want to take it with a pinch of salt. I've always considered the original Rocky's winning of the 1976 Best Picture Oscar, beating Taxi Driver in the process, to be one of the most outrageous miscarriages of justice in the Academy's history. The fact that Stallone was nominated for best actor makes a mockery of the whole process. He was a bad actor 30 years ago and he's a bad actor now. 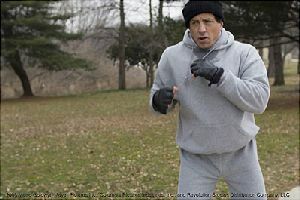 In Sly's own words, he "dropped the ball" on Rocky 5 and this, the final instalment, intends to put things right. 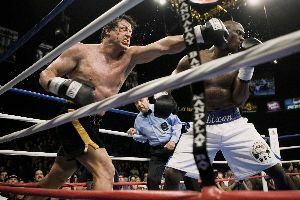 Unbelievably, the story actually puts the tired Stallone, now 60, back in the ring against the current heavyweight champion Mason Dixon (ho ho). The man himself looks more like his mum Jackie these days, with a face uncannily resembling a children's drawing, and the delivery of his lines is still as convincing as a politician's promise. You'd have thought that with sixteen years to write a story, the final result would've been pretty special. It's not. It's boring, predictable, and as clichéd as any movie you've ever seen. At least with the Rocky series you never knew whether the big rocky chap was going to win or not, so there's some uncertainty over this episode too, but it's a struggle to give a toss. As with all the prequels, it's clearly not easy to fill the running time - the side stories are just fillers - very drawn-out and tedious fillers - between the obligatory training montage and the long-awaited fight itself. These keystone parts are at least passable, mostly because of the stupendously stirring classic soundtrack, wisely unchanged from the original, but they're still cheesier than a mouse's ringpiece. However there are plenty of rodent arsephiles around, metaphorically speaking, and there are many viewers who will find Rocky's final fling evocative and fulfilling. If you're a hardened Rockomaniac, you're likely to consider this a worthy conclusion to the series. Rocky Balboa is exactly what you'd expect - a completely unbelievable and unnecessary conclusion to a series that ran out of ideas well over twenty years ago. Anyone who's too young to have seen any of the predecessors will wonder what on earth all the fuss was about. Much like I do. Testosterone Satisfaction Rating: 3/5 - it's a man's movie - just not this man. To enjoy this film you should be: a Rockyholic. Rocky Balboa was released in the UK on 19th January. Most reviews on this site are very good but a few fail tragically wide of the mark. As this one does. This film is a fitting climax to a legendary series of films. Rocky Balboa is NOT what you would expect as the review suggests. The style, pace and feel of the movie provide a very distinct new side of the Rocky story. Few similar film series have gone in this direction before and Balboa really gets it right.